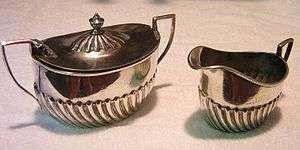 Holloware (hollowware, or hollow-ware ) is tableware such as sugar bowls, creamers, coffee pots, teapots, soup tureens, hot food covers, water jugs, platters, butter pat plates, and other metal items that go with the dishware on a table. It does not include flatware. Holloware is constructed to last a long time. It differs from some other silverplated items in being made with thicker walls and more layers of silverplate. Dining car holloware is a type of railroad collectible (railroadiana). The relative value of pieces depends on their scarcity, age and condition, and the popularity of the trains the items were used on. Holloware is the traditional gift in the UK and the modern gift in the US for the 16th wedding anniversary. Holloware is the traditional gift for jubilee or wedding in Russia. ↑ "Hollowware article". Encyclopædia Britannica. Retrieved 2008-04-23. ↑ "Wedding Anniversaries," compiled by librarians at the Chicago Public Library's Information Center (December, 2000).